(1) The productive class was made up of those engaged in agriculture, fishing, and mining, representing one-half of the population. (2) The proprietary class consisted of landed proprietors and those supported by them, which amounted to one-quarter of the population. (3) The artisan, or sterile, class, made up the rest of the population. 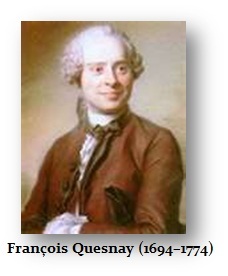 Quesnay’s Tableau is significant because it expressed the belief that only the agricultural classes are capable of producing a surplus or net product, out of which the state either could find the capital to support an expansion of the flow of goods and money or could levy taxes to meet its needs. Other activities, such as manufacturing, were regarded as essentially sterile, because they did not produce new wealth but simply transformed or circulated the output of the productive class. It was this aspect of Physiocratic thought that was turned against mercantilism. If industry did not create wealth, then it was futile for the state to try to enhance society’s wealth by a detailed regulation and direction of economic activity.